The Journal of Younger Dryas Impact Hypothesis Studies (formerly the prestigious journal known as the Proceedings of the National Academy of Sciences; PNAS) has just published Kennett et al, yet another paper promoting the hypothesis that the Younger Dryas, mass extinction of the megafauna, and the demise of the Clovis culture was due to a cosmic impact event. Kennett et al use OxCal to fit Bayesian models to radiocarbon and other dates on and around sediment layers containing (disputed) evidence (for example, nano-diamonds) of the purported impact. They find that all the candidate layers, from locations in North and South America, Europe, and the Middle East have the same date (with large uncertainties at some sites), and that this is compatible with the start of the Younger Dryas recorded in ice cores and other archives, within the chronological error of the dates. The copious supplementary material includes a description of all the dates and the OxCal models used. These could easily be rerun and modified to test the effects of assumptions that the authors have made. Since Kennett et al acknowledge assistance from Christopher Bronk Ramsey and others, I’m going to assume that the models are reasonable. If anyone suggest that one or more of the models are problematic, I’ll have a closer look at them. Since many of the sites were known from archaeological evidence to span the initiation of the Younger Dryas, that OxCal confirms that many of the impact layers to date to this time this is not too surprising. That all of the sites have this date is fairly impressive. I’m still not impressed by the cosmic impact hypothesis as a whole though. Objections arising from the absence of crater or of shocked quartz have been raised before. I want to raise two objections that I have not seen discussed before. 1) The cosmic impact is hypothesised to have generated a huge fireball that trigged forest fires across North America and Europe. A fireball intense enough to trigger mass forest fires should also melt ice. This should be evident as a melt layer in the Greenland ice cores – Greenland is not so far from the Canadian Laurentide Ice Sheet where the object is supposed to have landed. The initiation of the Younger Dryas in the Greenland ice cores has been closely studied, for example by Steffensen et al (2008) at NGRIP. A melt layer would be obvious, but Steffensen et al (2008) don’t mention one. Nor do Petaev et al (2013) who report a platinum spike in the GISP2 ice core that is attributed to an Ir-poor iron meteorite synchronous with start of the Younger Dryas (but not with the evidence of biomass burning). It could be argued that the shockwave from the fireball eroded any melt layer, this should leave a detectable erosive contact overlain by a disturbed ice. This is not observed. 2) Part of the climate impact ascribed to the cosmic impact is due to dust released by the impact. This dust should be recorded as a spike in the dust record in ice cores from Greenland that is simultaneous with (or slightly leading) the initiation of the Younger Dryas. 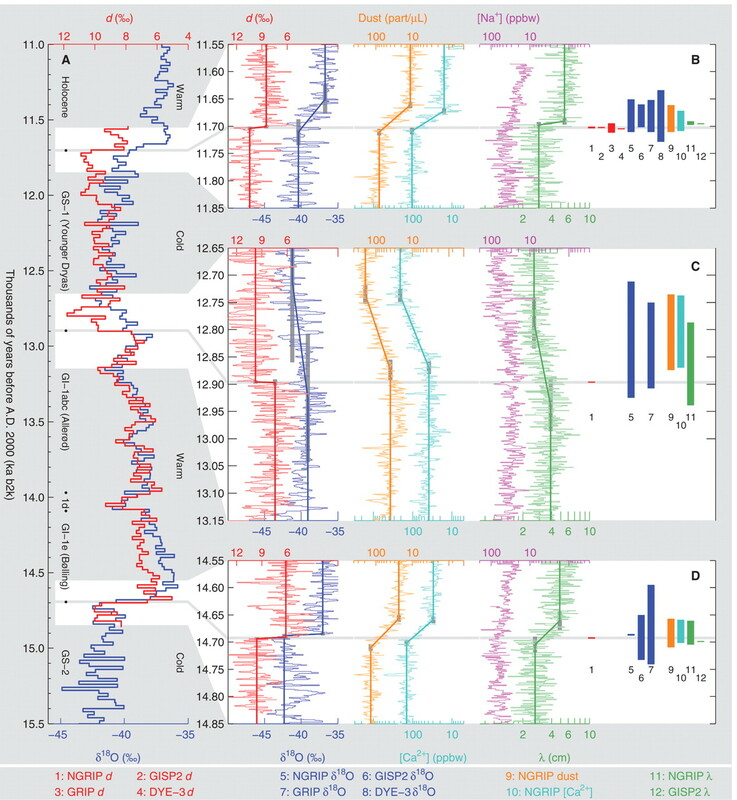 Steffensen et al (2008) present high resolution records of ice core proxies across the Younger Dryas initiation and report no dust spike simultaneous with the transition. Instead, the increase in dust lags behind changes in deuterium and oxygen isotopes. Multiple-parameter records from the NGRIP ice core 11.0 to 15.5 ka. (A) d (red) and δ18O (dark blue) at 20-year resolution over the entire period and details of the transition zones: (B) from GS-1 into the Holocene at 11.7 ka, (C) from GI-1a into GS-1 (Younger Dryas) at 12.9 ka, and (D) from GS-2 into GI-1e at 14.7 ka. [Left part of (B) to (D)] NGRIP records of d (red), and δ18O (dark blue) and logarithmic plots of dust content (yellow), calcium concentration ([Ca2+], light blue), sodium concentration ([Na+], purple), and annual layer thickness (λ, green) at annual resolution. Bold lines show the fitted ramp functions; gray vertical bars represent the 95% (2σ) confidence intervals of the ramp point locations. [Right part of (B) to (D)] Bars representing the locations of the fitted ramp functions for the NGRIP records shown to the left and for the corresponding results obtained using DYE-3, GRIP, and GISP2 data, where these are available at sufficient resolution. Neither the melt layer nor the dust records support the Younger Dryas impact hypothesis. Nor, as I’ve pointed out before, does the Older Dryas, a short cold interval between the Bølling and the Allerød. The Older Dryas proves that the climate at the time could flip from a warm to a cold state without cosmic intervention. This entry was posted in Peer reviewed literature and tagged impact, Kennett et al 2015, Younger Dryas. Bookmark the permalink. This is truly the hypothesis that would not die, and I’m surprised they are still pursuing it. However, you can’t deny that it has left a trail of really good science. The nanodiamonds, lonsdaleite, sp(n) bonding of carbon in general, defects, dislocations, imperfections and twinning planes in nanodiamonds, the Moorhead phase Lake Agassiz draw down controversy (the arctic vs.the St. Lawrence), I could go on and on. I did comment on this over at Cosmic Tusk even though it is generally a crank website, so I won’t regurgitate that here, but I will link to it if you care to read it. Agreed, wrong hypothesis can provoke lots of good science. At least parts of Ruddiman’s early anthropocene probably belong to this class. of Paleoindian Expansion Feasible? Radiocarbon. 52(2):337-345. Fiedel, S., 2015, The Clovis-era radiocarbon plateau. In A. M.
pp. 21-35, Clovis : on the edge of a new understanding. College Station : Texas A&M University Press. 364 pp. Is there Antaric icecore evidence of dramaic ice meltdown with a blackmat layer immediatly above that for an event that occured around 1000 years ago? I am not aware of a melt layer in ice cores from either Greenland or Antarctica at the start of the Younger Dryas. Greenland is closer to the supposed impact area so they should be visible here. Melt layers should be dectectable as the ice morphology changes.